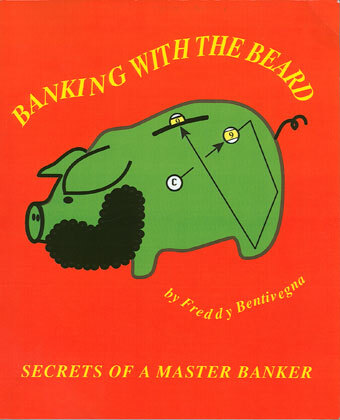 Freddy ‘the Beard’ Bentivegna has just published a unique new book on banking, entitled Banking with the Beard, Secrets of a Master Banker. 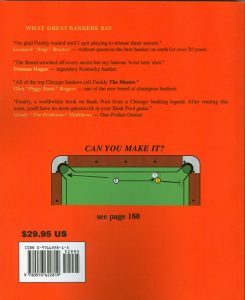 Chicago has for years been host to a culture of big action Bank Pool, home to legends such as ‘Bugs’ Rucker, Glenn ‘Piggy Banks’ Rogers, and of course, ‘The Beard’. Traditionally, top after hours players were very tight lipped about divulging any ‘how to’ secrets. The hustler’s credo has always been never show your true speed, let alone give up any trade secrets that might come back to beat you! That’s one of the things that is unique about this book, because it comes from the genuine article. A veteran of countless action matches, from the ‘practice table’ at Johnston City to Chicago’s legendary Bensinger’s poolroom, Freddy came up through the school of hard knocks, against many of the best bankers of all time. This is top quality instruction from a rare source: a top after-hours player, and he doesn’t hold back in sharing his hard-earned and valuable knowledge. Along with that, Freddy is one of the most entertaining and articulate legends of pool, with plenty of real life experience to both enliven and legitimize the advice he shares. Everyone who has ever worked seriously at banking quickly discovers that angle in equals angle out is rarely true, because the be-deviling effects of speed, cloth, and english combine to throw off the ‘angle out.’ One of the major ‘secrets’ Freddy covers in this book is his straightforward system for making the necessary adjustments to successfully manage those be-deviling effects. He breaks down common banks into manageable increments – kind of a dial-a-bank system. Even an experienced banker is bound to pick up something in here that is worth the price of the book. For anyone wishing to improve their banking, this book will really get you moving in the right direction. I found the writing and diagrams clear and easy to follow. Besides the banking techniques, tips for both One Pocket and Bank Pool show up here and there throughout the book. My only suggestion would be to include more Bank Pool and One Pocket game strategy, because it is clear Freddy has a ton to offer. In fact, he says he is already working on his next book. Well, count me in as looking forward to the next one, too.